The photobook "Amsterdam by Night" offers a refreshing view on Amsterdam and her impressive history. The night photos take the reader on a journey through time: from the early origins as a small village along the Amstel, via the Golden Age, till the modern city. The story offers background information and other interesting knowledge that make this book to a reference, both for the newcomer as well as the original Amsterdammer. It's time for a renewed encounter with Amsterdam by Night. Follow this link for a preview of "Amsterdam by Night" as PDF. "Amsterdam by Night" is, after "Wielder by Night" (2013), the second photobook of (night)photographer Wino Wijnen. In his nightphotography he aims for a natural atmosphere, without the use of flash or advanced digital processing. His photographs of Amsterdam at night manage to capture the beauty and calmness of the city at rest, contrasting with the livelyness during the day. "The elegance of our city is beautifully portrayed". “Amsterdam by Night offers a further acquaintance with the city, both for newcomers as well as the original Amsterdammers” - Mr. E.E. van der Laan, Mayor of Amsterdam in the preface. The book is available as a hardcover of 152 pages, 245(B)x294(L)mm containing more than 100 photos of nightly Amsterdam and costs only CHF 35,95 (35,- euro). "Amsterdam by Night" is published independently and there will only be a limited amount of books available. 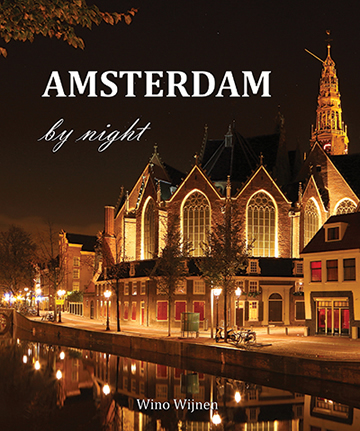 Order "Amsterdam by Night" therefore via the Webshop, and be sure that you don't miss this unique publication. The book is also available in a select number of shops (watch the map below). Shops offering "Amsterdam by Night"